Deanna and I were looking for a new computer desk for the craft area in our house. There's lots of stuff out there, but it's all pretty expensive. On a whim, Deanna stopped in at Staples and found a great corner desk on sale for $130. It was just the right size, and despite being made of particle board, it was pretty sturdy. Great. We ordered it yesterday and picked it up this afternoon. 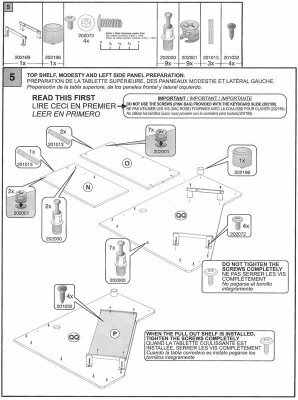 Like all great particle board furniture, it came packed flat with about a thousand pieces and a set of instructions that make my old model-airplane kits seem obvious. Luckily I've done my share of formal drafting before and I'm pretty good at reading isometric-projection diagrams. So long as you look carefully at where all the holes, screws, and wooden-pegs are shown you can usually avoid putting anything together upside down or backwards. OK, no problem. I'm not an idiot, and I read directions. Just one problem. Where are the screws I'm supposed to use instead? Better yet, why do the screws inside the pink bag look exactly like the screws shown in the instructions; even down to the same diameter, length and thread-pitch? I do some more digging. No alternative source of these screws can be found. And the pink bag is looking more and more like the real thing all the time. Oh, screw it (bad pun, sorry), I use the screws in the pink bag anyway. They sure seem to fit well. In fact, they fit perfect. Gotta' love those instructions. Not only are they confusing, but they are wrong. And not just a little wrong. They're wrong inside the BIG IMPORTANT WARNING box. Fortunately, the desk has come together nicely, it looks great, and it fits in the room just where we had intended. Your desk will spontaneously explode one day just because you used the pink screws. Either that or the desk makers are homophobes and don't want anyone to use screws that come from a pink bag. In any case, it ought to be interesting. It's like a twilight zone story... you never know what the consequence will be and when it will strike.